A. All teams are to be present at their allocated prior to the game, to do the toss. i. Any team not present can forfeit the right to a toss. The other team can then choose to field first (which means the other team only initially needs 2 players present to bat), or can choose to bat first, meaining they would have to wait until the offending team has 6 players present to take the field. ii. If both teams are late, the first to have 6 players present will have the right to choose whether they bat or bowl first. [See Rule 7B(i)]. i. Providing the player's arrival is before the commencement of the 13th over of the first innings - in other words, the late player/s must be able to bat and bowl their full quota of overs. ii. If a player arrives after the 13th over of the first innings, centre/tournament management's permission can be sought for that player to join the game. If the player's team is batting when he arrives, that player may not bat. If the team is bowling, that player may not bowl. The player is regarded as a late player, not a substitute, and may keep wickets if their team is fielding. iii. Players who arrive late to field, must wait until the end of the over in progress before entering the court. A. If a team is 1 player short: When batting: after 12 overs, the captain of the fielding side will nominate 1 player to bat again in the last 4 overs with the remaining batsman. When fielding: after 14 overs, the captain of the batting side must choose 2 players to bowl the 15th and 16th overs. The non-consecutive over rule applies. B. If a team is 2 players short: When batting: after 12 overs, the captain of the fielding side will choose 2 players to bat again for the last 4 overs. Many believe they must choose particular batting "pairs". This is not the case - any two players may be chosen. When fielding: after 12 overs, the captain of the batting side must choose 2 players to each bowl 2 of the last 4 overs. The non-consecutive over rule applies. C. If a selected player is not available to bat again, a 10 run penalty will apply and another player is then selected. If you are aware a player is going to have to leave the game early for legitimate reasons, inform both the other captain and the umpire. Under these circumstances, that player should not be chosen to bat/bowl once they have left, and the 10 run penalty if they were chosen wouldn't (or at least shouldn't) be invoked. D. If a team has, or is reduced to, less than 6 players (regardless of the reason/s) and a substitute player cannot be found, that team will forfeit the game [See Rule 1C - Fielding a team]. E. A substitute is a player who joins the game, after it has commenced, to replace an existing player who is incapable of continuing to play the game due to injury or illness suffered during the game. The inclusion of a substitute is on the approval of the umpire and/or centre manager or tournament organiser. F. Substitutes may only field. They cannot bat. Batters who are unable to complete their allocated overs are not substituted, but are replaced by a nominated team member, as above in Player Short. G. As above, a substitute cannot bat. Neither can they bowl or keep wickets. H. The correct uniform rules apply to substitutes, as do the uniform penalties. J. Once substituted, a player may take no further part in the match. K. Injuries where you bleed. i. Any player suffering an injury that results in bleeding must leave the court for treatment unless the bleeding can be stopped within 2 minutes. The player and any attending medical staff must ensure that no blood sloshes onto the court, its fittings or fixtures, or other players. We should probably add spectators and passers-by here too ...... but seriously, injuries resulting in bleeding are very rare. ii. Any clothing the injured player bleeds on must be removed and replaced. Blood should be washed off the body before rejoining the game. iii. Players must leave the court to have blood washed off their body. AICF rules state that players must leave the court to have any "surface" blood washed off. It's pleasing to know they consider all the blood you have under the surface is okay. v. If the injured player is unable to return to the game (no, no player has yet bled to death), the "Blood Replacement Player" will stop replacing blood and become a "Substitute Player", an altogether more wholesome role. vi. A player who leaves the court to attend to bloody matters must wait until the end of the over in progress before returning to the game. vii. 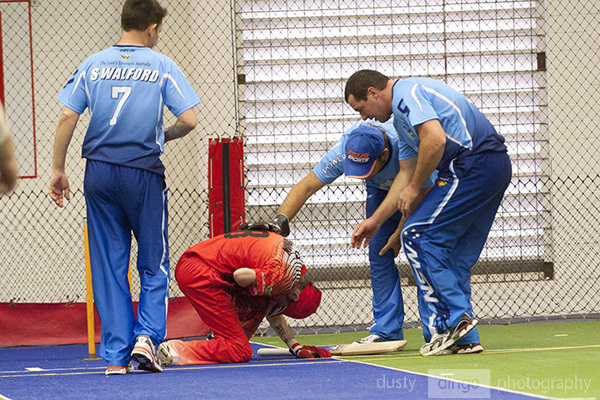 The umpire must clear a previously bleeding player before they return to the game. viii. As with substitutes, the "blood replacement player" is also not able to bat, bowl or keep wicket. ix. 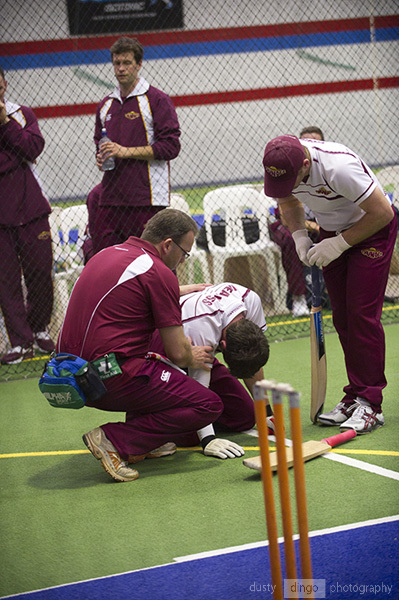 In the case of a "Blood Related" (aka Bleeding) injury, the following conditions will apply: When batting: The captain of the fielding side will nominate 1 player from the still-bleeding player's team to bat with the remaining batsman. This must be done as soon as it is realised the bleeding isn't going to stop. When fielding: If the player starts bleeding whilst bowling (which could be a tad messy), the captain of the batting side will nominate 1 player, from the still bleeding player's team, to complete the over. The non-consecutive over rule still applies of course. L. Injuries where you don't bleed. i. Players who are injured but sportingly don't bleed will be given 2 minutes to attend to their injuries. ii. If the player is not ready to recommence play after the 2 minutes, the player must leave the court to recover from their injuries. iii. Provided they have not been substituted, a player may return to the game after they have recovered from their injuries. iv. Any player who leaves the court to attend to an injury must wait until the end of the over in progress before returning to the game. v. Any substitute who replaces an injured player cannot bat, bowl or wicket keep. M. It would be nice if all centres had first-aid staff in attendance ... but they don't. Even some recent National Championships in Australia didn't have first-aid officers present, a particularly sad and sorry state of affairs for that level of competition. i. If a batsman is injured, the captain of the fielding side will nominate 1 player from the batsman's team to complete the injured batsman's remaining overs. ii. 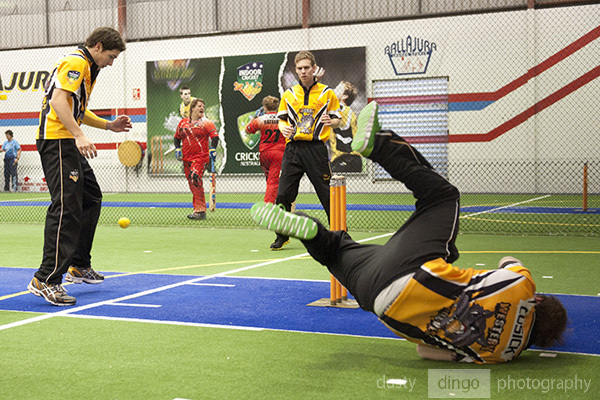 If a bowler is injured during their 1st over, 1 player is to be nominated to complete the over. The injured player's 2nd over will be bowled after the 12th over and another player may be chosen by the opposing captain. The non-consecutive over rule still applies.